Reply, in the from of a short neat draft in Cullen's hand, addressed to the sister of an unnamed female patient, whose case has been communicated to Cullen by 'Miss N. Ord'. tipped into the front of casebook Volume 11 ( 29 June 1778-19 May 1779). Two pages with the verso blank. Probably relates to the Ords of Weetwood who appear elsewhere in the archive. Dating entirely based on placing in Casebook which may have been undertaken by an early archivist rather than by Cullen or his assistant. 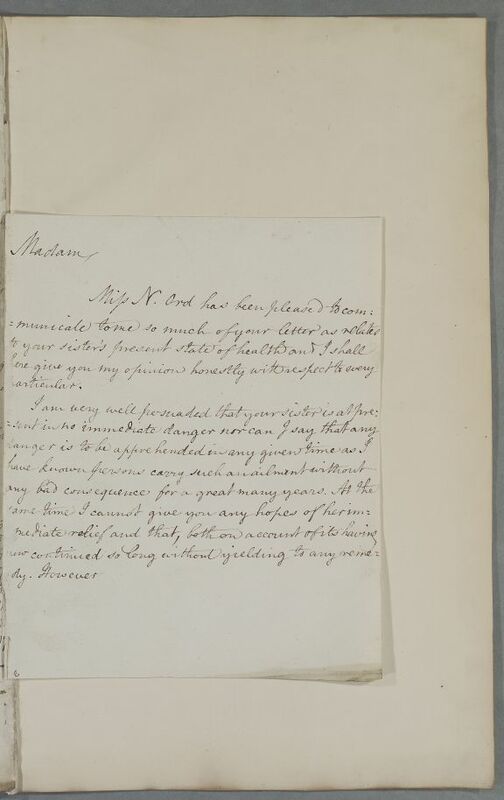 Summary Reply, in the from of a short neat draft in Cullen's hand, addressed to the sister of an unnamed female patient, whose case has been communicated to Cullen by 'Miss N. Ord'. tipped into the front of casebook Volume 11 ( 29 June 1778-19 May 1779). Two pages with the verso blank. Probably relates to the Ords of Weetwood who appear elsewhere in the archive. Dating entirely based on placing in Casebook which may have been undertaken by an early archivist rather than by Cullen or his assistant. Case of an unnamed female patient, whose situation has been communicated to Cullen by 'Miss N. Ord' and who is thought to be in no immediate danger.